Join the Star 98 VIP Club! MORE shopping! MORE entertainment! MORE pampering! MORE OF EVERYTHING! 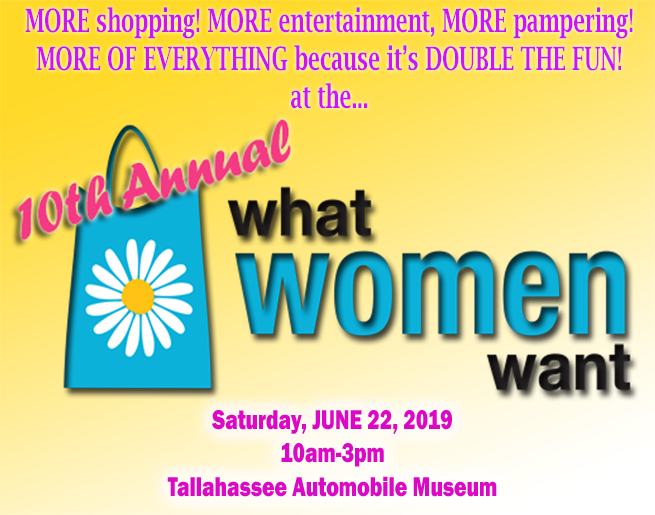 It’s DOUBLE THE FUN at the 10th Annual “What Women Want ” Expo brought to you by Star 98 & 96.1 Jamz and is presented by Safe Touch and Tallahassee Woman Magazine, taking place on Saturday, June 22nd from 10am – 3pm at the Tallahassee Antique Car Museum. This annual expo features over 100 vendors, door prizes, discounts and notable speakers! Admission is FREE, but get there early! The first 100 women through the door will receive a gift bag full of surprises! Also, a VIP winner will be chosen to receive luxury transportation to and from the event and will enter the expo through a VIP entrance where they will receive a very special gift bag! Be sure not to miss out on the most anticipated event of the year! Hosted by STAR 98.9 and 96.1 JAMZ WHBX Tallahassee’s Big Station! If you are interested in purchasing a booth please contact Dot Ealy @ 850 – 201 – 3005!